Mexicali luchador since 2007. He was trained by Mr. Tempest and Inmortal. 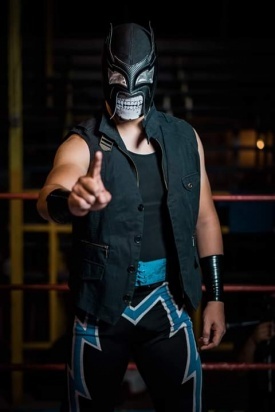 He made his debut on December 2, 2007 in Arena Coliseo Mexicali in a tag team match with Key Lepe against Metálico & Lobo del Norte Jr. Wrestles in Baja California; made a tour with EAW. Moreover he had wrestled in independent promotions in California such as IV Lucha and VWE; and Lucha Libre Voz in Arizona. His ring name was inspired by the 1994 film Maverick. Over the years he had inspired his mask and gears designs on comic book characters.